Family Guy devoted a whole episode to Donald Trump and it included a terrible scene. Showrunners Rich Appel and Alec Sulkin took some time out to explain why they felt that the scene in question was necessary. Poking fun of the president is nothing new and it's something that shows like Saturday Night Live, South Park, late night talk shows, and The Simpsons have been doing for decades. However, Family Guy just took it to the extreme. During the 2016 presidential campaign, audio leaked of then candidate Trump bragging about what he likes to do to beautiful women. This coined one of Trump's most famous slogans, almost bigger than "you're fired!" On Sunday's episode, the animated version of Trump grabs Meg Griffin by her you-know-what. It isn't shown, but is heavily implied and in pretty bad taste, even for Family Guy. Rich Appel had this to say about the scene. "Let's play a game: If I say the words Donald Trump to you, what's the first thing you think? ... The only point in using Meg was to show that men like Trump can attempt to prey on vulnerable people. It's clearly offensive and gross and not appropriate. But not only didn't we not want to show it, we don't want to be too explicit about exactly what happened." Throughout the Family Guy Donald Trump episode, the writers make jokes about the president that have been made a million times before by a ton of other shows and even news programs. In the show's defense, it was written months ago, and doesn't have the current events dialed in like South Park does, and even that show stopped with the Trump stuff a long time ago. Everybody has heard the jokes about the orange spray tan, little hands, and that he loves his daughter way more times than we wish to count. 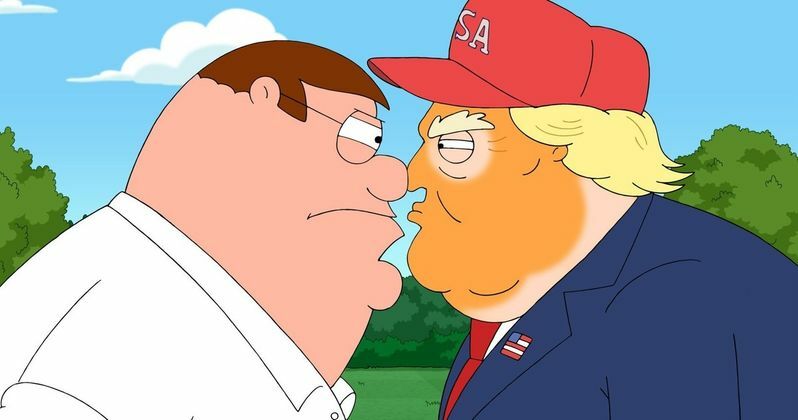 We live in an incredibly politically divisive time and Family Guy could have potentially put a bit more thought into the episode, especially since the main character seems like he would be a Trump supporter. That could have made for a pretty interesting episode. With that being said, nobody makes fun of Trump better than he does on his own, which makes shows like Saturday Night Live and Family Guy almost obsolete when trying to take on the president. Regardless of political affiliation, Donald Trump has said and done some pretty funny things at his expense. That's why most shows that feature him just end up taking what he says in real-life and turning that into the joke. None of us ever needed to think about Meg Griffin like that or even a cartoon version of Trump with exaggerated orange spray tan and tiny hands. You can read more about what the Family Guy showrunners had to say about their Donald Trump episode over at Entertainment Weekly.